Lawrence Lee Treadwell II, a loyal and dedicated husband, father, and deputy, died Monday, July 23, 2018 in Detroit, with his wife by his side. Larry, 52, of Charlotte, was born August 24, 1965 in Lansing, the son of Larry and Geneel Treadwell. Growing up, he spent time with his grandparents on the family farm in Olivet, a place that remained near to his heart throughout his life. He graduated from Charlotte High School in 1984 before enlisting in the U.S. Navy and serving aboard the U.S.S. Midway in the Persian Gulf. Upon his return home, he worked in corrections at the Federal Correctional Institute in Milan before entering law enforcement academy. 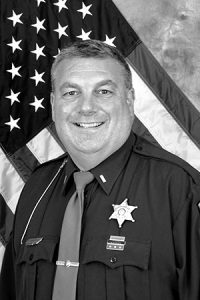 He joined the Eaton County Sheriff’s Office in 2000 as a deputy. On October 3, 2001, he married Teresa Ann Freer before immediately answering the call to service in 2001 after 9/11, deploying overseas to defend his country. Upon his return, he completed his bachelor’s degree and worked his way up to Lieutenant, overseeing much of the operations of Eaton County corrections, including the work release program. Throughout his lifetime, Larry loved time spent in the outdoors. He enjoyed fall deer hunting on the Treadwell farm with his cousins in his early days, and his sons in later years. Larry and Teresa enjoyed family camping trips with their kids and traveling to many cheerleading events, where Larry served as the honorary cameraman. Above all, Larry loved his family, devoting his life to their wellbeing. Larry is survived by his wife of 17 years, Teresa; sons, Larry Treadwell III and Lance Treadwell; daughter, Meagan Treadwell; brother, Chad Treadwell; mother, Geneel; grandfather, Sterling Treadwell; and his nieces, nephews, aunts and uncles, and cousins. He was predeceased by his father, Lawrence Lee Treadwell, Sr.; and his grandmother, Arlouene Treadwell. Funeral services were held at 11 a.m. on Friday, July 27, 2018 at Charlotte Assembly of God Church. Interment took place in Lee Center Cemetery in Olivet. Memorial contributions may be made to Michigan Law Enforcement Monument Fund at michigan.gov/mleom in Honor of Lt. Larry Treadwell.